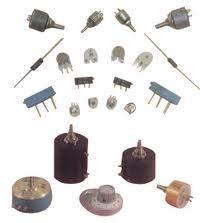 Pearl Electronics is a leading Manufacturer, supplier and Importer/Exporter of Potentiometer in Oman, Abu Dhabi, Mascot, Indonesia, Pan India. 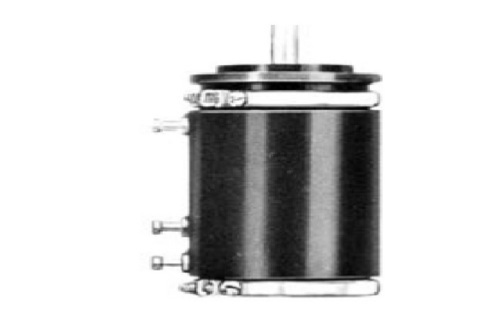 Potentiometer comprise a resistive element, a sliding contact (wiper) that moves along the element, making good electrical contact with one part of it, electrical terminals at each end of the element, a mechanism that moves the wiper from one end to the other, and a housing containing the element and wiper. Types of Potentiometer: Rotary, Single turn, Multi- turn (3 turns ,5 turns & 10 turns), Linear, Carbon pot - Volume control, Cermet, Conductive plastic, Wire wound, Trimpots, Servo Potentiometer ( Continuous). 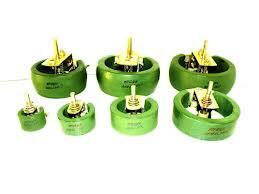 We deal with Potentiometer in Oman, Abu Dhabi, Mascot, Indonesia, Pan India. ECIL (Electronics Corporation Of India Limited)- Dials And Knobs. We make available ECIL potentiometers in resistance range : 100 ohms, 200 ohms, 1k, 2k, 5k, 10k, 50k, 100k, 200k, 500k We are stockist of ECIL dials and knobs. 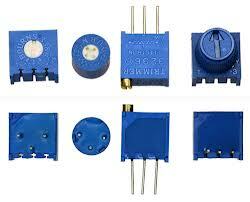 We make available ECIL potentiometers in resistance range : 100 ohms, 200ohms, 1k, 2k, 5k, 10k, 50k, 100k, 200k, 500k. 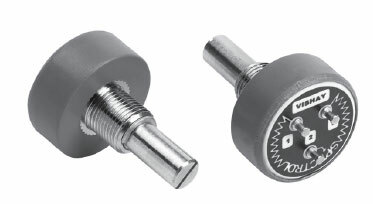 Potentiometers comprise a resistive element, a sliding contact (wiper) that moves along the element, making good electrical contact with one part of it, electrical terminals at each end of the element, a mechanism that moves the wiper from one end to the other, and a housing containing the element and wiper. Types of Potentiometer : Rotary, Single turn, Multi- turn (3 turns ,5 turns & 10 turns), Linear, Carbon pot - Volume control, Cermet, Conductive plastic, Wire wound, Trimpots, Servo Potentiometer ( Continuous). 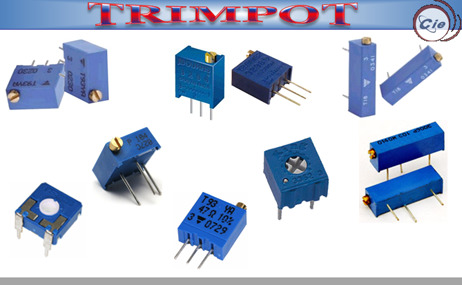 Trimpots come in use at the places where there is a requirement of smooth and continuous variation of voltage, current or resistance. We also provide for these products according to the demands and needs of our customers at affordable prices. We are stockist of a variety of dials required to mount on the potentiometers., They are also known as counters and are used to count the number of revoltuions.The dials are available in various sizes.Available in Round and rectangular shapes in metal body and plastic body. The dial is indicative in their counter. Makes available: Pankaj/ Pavan, Duodial, Vishay Spectrol, ECIL, Bourns, etc. 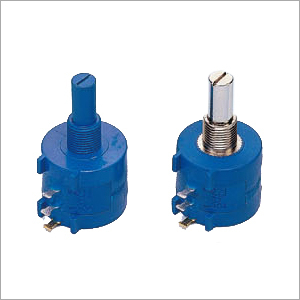 Continuous rotation potentiometers are known as servo potentiometers.Other names include: Servopot, Endless rotation potentiometer, Continuous rotation pot. 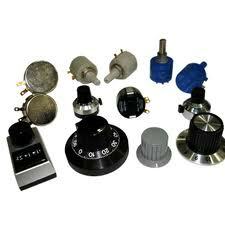 We are stockist of Bourns potentiometers & Dials. : Precision pots Multiturn - Helipot- 10turns, 5 turns, Precision pots single turn., Turn counting Dials , Servo potentiometers. 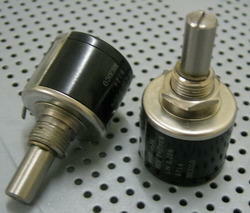 We are stockist of Vishay/ Spectrol Potentiometers. Vishay potentiometers feature industry-leading power ratings, lifetime cycles, and temperature coefficients, and include devices optimized for both industrial and military applications. Multiturn potentiometers, Dials, Helipots, Servo Potentiometers.Resistance 100ohms - 500k , Wattage:- 1 watt to 5watt, Single turn/ 3 turns / 10turns. ECIL (Electronics Corporation Of India Limited)- Dials And Knobs We are stockist of ECIL potentimeters, dials and knobs.We make available ECIL potentiometers in resistance range : 100 ohms, 200ohms, 1k, 2k, 5k, 10k- 5Y10 / SY10, 50k, 100k, 200k, 500k. Available in 3 turns and 10 turns. Available wattage - 3 watt and 5 watt.